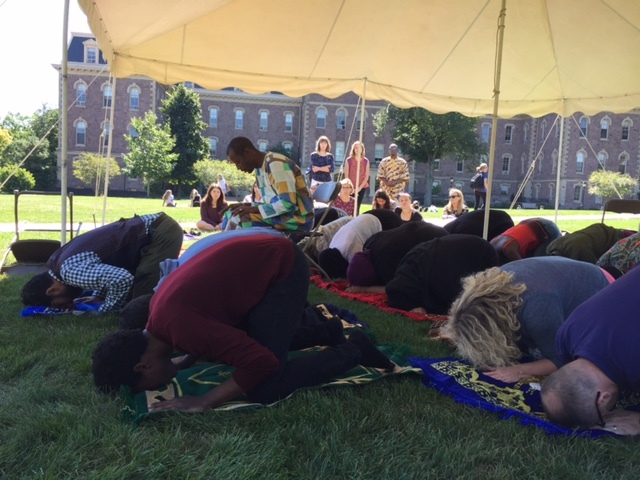 Just before noon on Thursday, a cluster of Lafayette students, faculty, and guests gather on the Quad and wonders aloud: For whom should we pray? There is no shortage of candidates. Even when one is standing or kneeling on the sun-dappled Quad, the problems of the world don’t seem so far away. Myanmar, where a war has made refugees of more than half a million, is discussed. The prayer service was supposed to be dedicated to them, but shouldn’t others be included? asks Ayat Husseini ’20, president of the Muslim Students Association. “Mexico,” says Mackenzie Lawlor ’20. A magnitude 7.1 earthquake had recently killed hundreds there and turned cities to rubble. Some of the students remove their shoes and kneel on prayer mats. Other gather at the edges of the tent that has been positioned at the edge of the Quad. Sitting on a folding chair and surveying the scene through Ray Bans is Cheikh Lô. The international singer from Senegal had performed at the Williams Center for the Arts the night before, and this prayer service is the last of three days of Senegalese, African, and Islamic-related programming. 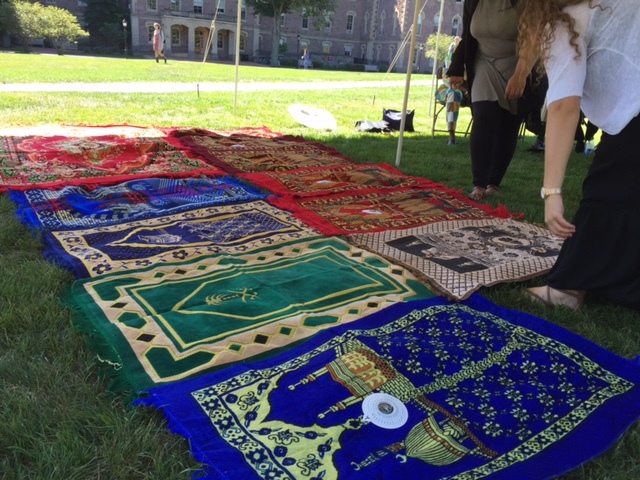 Lô and others tied to his performance came to Lafayette as part of a multidisciplinary project called Tapestries: Voices Within Contemporary Muslim Cultures. 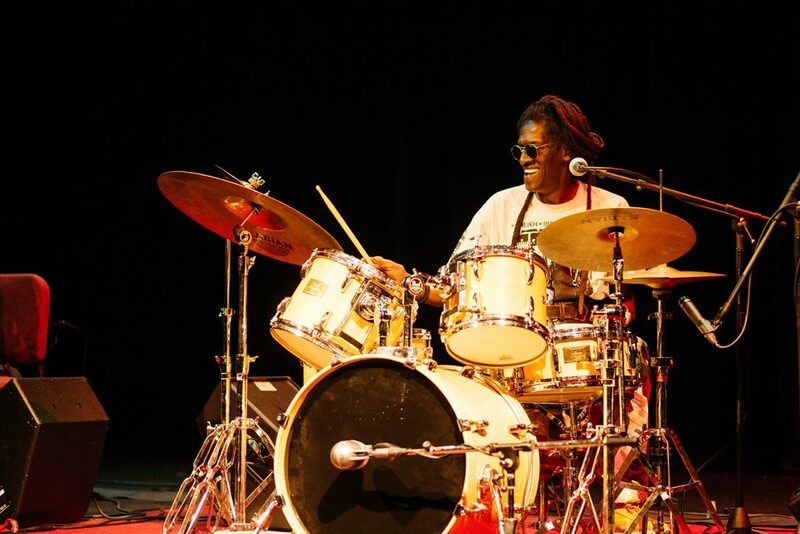 Throughout 2017 and 2018, it will feature performances at the Williams Center for the Arts like Lô’s and related programs throughout campus that focus on arts and culture with roots in Muslim-majority regions and in the United States. In addition to his concert and the prayer service, Lô participated in panel discussions at Skillman Library, viewed art collections, and spoke with students, mostly with the help of interpreter Wendy Wilson-Fall, associate professor and chair of Africana studies. Wilson-Fall met the legendary performer while in Senegal with a group of students during a short-term study abroad trip in January. Lô is a member of the Baye Fall, a movement within the Mouride Sufi order of Islam, which accounts for 40 percent of the population of Senegal. It is a peaceful religious order that emphasizes tolerance. Under the tent, Husseini instructs the uninitiated in the flow of standing and kneeling that make up a customary Muslim prayer. Muslims pray five times a day in this way, facing Mecca, and the next appointed time is in minutes. Everyone is invited to join. While they wait, Wilson-Fall tells stories about Amadou Bamba, the founder of the Mouride brotherhood in Senegal. A student turns up the volume on a boom box and Islamic chants lilt across the Quad. Others wandering between classes pause to look into the tent. Led by Youshaa Patel, assistant professor of religious studies, with the participation of Matar Niang, manager of the Cheikh Lô band, the prayer lasts about five minutes. More than a dozen participants stand, kneel, and lie prostrate on their mats while leaders chant, softly. Nina Milligan ’20, a government & law and Africana studies double major, watches. She can feel the eyes of passersby watching the peaceful gathering. Tapestries is made possible in part by a grant from the Association of Performing Arts Professionals, Building Bridges: Arts, Culture, and Identity, a component of the Doris Duke Charitable Foundation and Doris Duke Foundation for Islamic Art. The two administrative leaders for Lafayette were Jennifer Kelly, associate director of music and director of the arts; Alex Hendrickson, College chaplain and director of religious and spiritual life, and Hollis Ashby, executive director of the Performance Series at the Williams Center for the Arts. Also serving on the administering committee for the Tapestries grant were Rachel Goshgarian, assistant professor of history, and Jamila Bookwala, dean of curriculum and research.